People are genuinely surprised when they peer at my kids’ bookshelves. Inevitably they say ,”Hey, not all of these are Simon & Schuster books!” Nope. Then: “Did someone get them for you?” No, I bought them. I buy books like a normal person, at bookstores, online, at Buy Buy Baby and through the book club at my kids’ school. And when the subject of kids’ books comes up I get the, “Well, you just know exactly what to buy.” Nope again. I’ve written about books that I thought my kids would love and they hated. There is a rather long list of them. As a publishing professional yes I have (or should have) a good understanding of age levels, what’s new, what authors might be right for certain subjects. I do know what’s on the bestseller lists, what’s being reviewed, what’s being buzzed about, and what’s ending up on award lists. It’s part of my job to know that. But translating that information to my kids is a little tricky. Sometimes I’m at as much of a loss as any other parent in finding the right book for my kids. I wander into bookstores and am overwhelmed. I fall down rabbit holes online. I read lists of recommended books and my eyes glaze over. I have to search out good books for my kids. I get asked a lot about lists. When you transition from milk to food with a baby there are differing opinions but there is a general consensus as to what foods you should try first. Not so for book recommendations, the Wild West of lists. 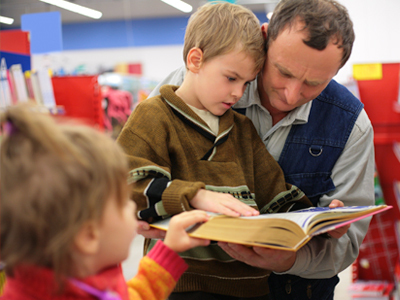 “Is there a list of best books for a 4 year old boy?” Yes. The problem is there are a lot of lists and you have to wade through all of them. Some are curated by educators, some by reviewers, some by people who know books and some, in my opinion, who don’t. Above all else I always trust a human over a list. Your local librarian is a wonderful resource. I have heard parents walk in to the children’s section at my branch and say “I have a 3 year old who loves trains” and within ten minutes that grateful parent has at least three books in hand. 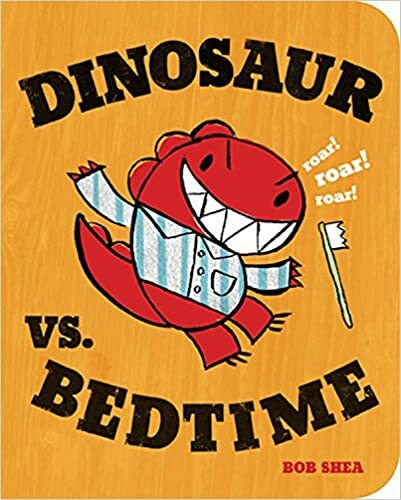 I have said “my child loves this book…anything you might recommend like it?” and each librarian has nailed it, opening my eyes to books I may not have otherwise have thought of (Dinosaur vs Bedtime was the last one, and it was perfect). Head to your local book store. A children’s bookseller is guaranteed to know their inventory. I fondly remember the long gone Bookworm bookstore I grew up trekking to on a regular basis. The children’s buyer always had a book that he knew I would love (and he was always right). He’d remember what I was reading and he always had something ready for me to try next. Other parents are also great resources. If your children have similar taste (or better yet, if you do) ask what books they are reading in their house. I either just made another mom’s day or killed our friendship when I told her there were indeed more No, David books (David Goes to School was the one I recommended). I hope it’s just my kid who ran around gleefully singing “no no no no” and laughing hysterically for a good month after reading that one. In terms of lists that are helpful I always go to the Bank Street College Best Children’s Books of the Year list. They break the books up by age which makes it a little more manageable to search and they give a brief summary of each title. 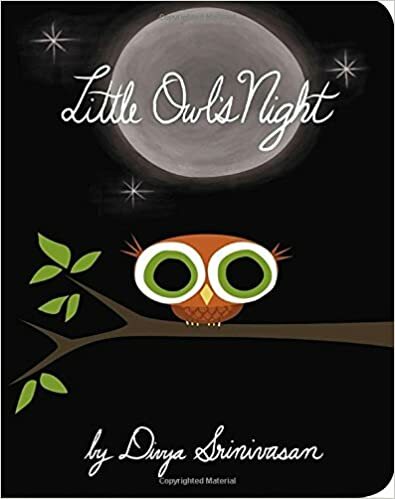 They are generally all well written books that are almost always well suited for the intended audience they recommend (not easy to find a list that hits it as straight on as this one in terms of reading levels and appropriate content). It’s a very thorough comprehensive list with 600 titles (don’t try to do this one standing in the store; you need time to go through it). The next list I hit is the New York Public Library Annual Recommended Children’s Books. When you think about the population New York serves with its library system it’s no wonder their list reflects a pretty diverse subject matter. What I also like is the fact that it’s one of the few institutional lists that includes some more commercial books as well. My issue with many awards lists is that while they include great books they often have highbrow subject matter. The NYP list has a very nice broad range. They don’t shy away from silly. I think Scholastic has tremendous resources on their parents site, but I prefer to go to their teacher’s site. They have an awesome “book wizard” for finding books on grade level but the feature I like best also has a “search for similar books” option. So you could type in “Dinosaurs vs. Bedtime” and 1042 books will pop up, many about dinosaurs. You can then drill down by clicking an option called “Book Alike” that will bring up books in similar formats and for a similar age group. It’s one of the most helpful widgets I’ve used because it actually works. I also like to read the teacher’s blogs on the site as they give me insight into what they’re using in their classroom and why they think those books are great for that age group. When it comes to finding great books I have more resources because I know editors, read trade journals, and know which reviews might resonate the most in terms of guiding me. I definitely have an advantage. But at the end of the day it’s me, a bunch of information, and a gut feeling that the book in my hand or in my cart might be the one to make one of my children’s eyes light up. There’s only one way to know if I’m right: I close the book. “Read it again, Mama?” Yeah, that one’s a winner. 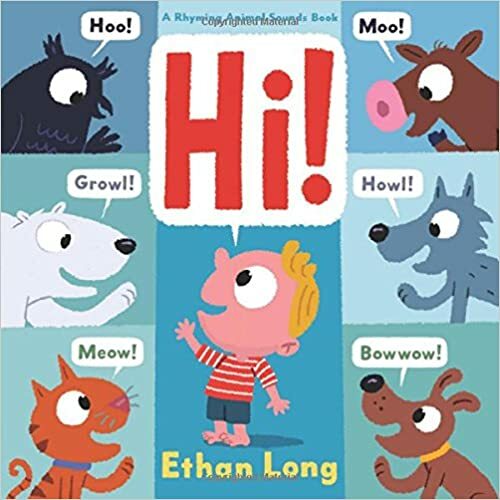 A string of comically stylized animals greet each other in masterfully rhyming couplets—an owl’s “hoo” is answered by a cow’s “moo”; a crow’s “caw” is returned with a donkey’s “hee-haw”—all leading up to the “hi!” and “good-bye!” of a human toddler and his mom!